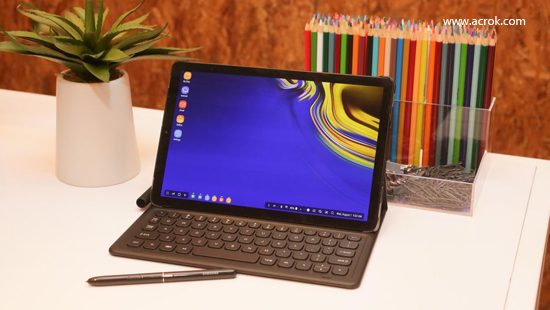 The Samsung Galaxy Tab S4 raises the bar on its predecessor with a bigger display, better performance and the addition of Samsung DeX, which gives it a PC-like interface. Samsung includes an excellent S Pen for drawing and writing on the 10.5-inch 2560 x 1600 sAMOLED display. Powered by a Qualcomm Snapdragon 835 processor, the Tab S4 is essentially an Android competitor to Windows 10 two-in-ones. "I wonder if that's appropriate to be asked on this board, but I think I can get help here... I wanna to connect a blu ray driver to my Samsung Galaxy Tab S4 via USB, what additional equipment I need? I dont mind spending money if it's possible... Doulias"
"Can I play Blu-ray ISO on tne new Galaxy Tab S4? I plan to copy these movies to my tabet, but they will take up a lot of storage space. How to commpress Blu-ray ISO files for playing on Galaxy Tab S4? Should I install a Blu-ray player onto Samsung new Android 8.1 tablet? 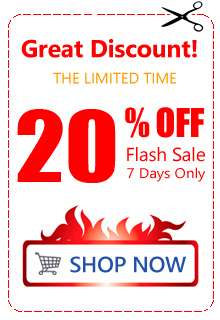 - Mulligan"
Enjoy Blu-ray movies using Blu-ray players at home has never been a problem for us. The question is, what if you'd like to play your favorite Blu-ray movies via tablet when on the road? Bringing several discs along tend to be inconvenient, not to mention they jump on the most crucial scenes and are prone to scratches. Now that tablet have rocked into the mainstream. Why we get a tablet? It is convenient to carry, I think it's a very important reason. If you still plan to connect Blu-ray player to Galaxy Tab S4 for playing Blu-ray disc, Blu-ray ISO or Blu-ray folder, I suggest you give up this strange idea, and don't waste time on looking for a Blu-ray player app for Android tablet. To save your time and money, the best workaround for you is to rip and copy Blu-ray movies to Galaxy Tab S4 playable video formats via a third party Blu-ray ripping tool. From Samsung official website, we know it natively supports video formats in 4K/1080P H.264 MP4, Divx HD, Xvid, etc formats best. So, you can rip and convert Blu-ray discs to Galaxy Tab S4 supported formats via a third party Blu-ray ripping software. 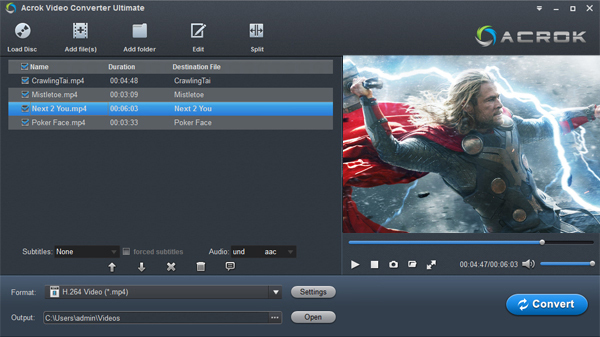 Acrok Video Converter Ultimate (Windows /Mac) is highly recomended here. Which is the all-in-one Blu-ray decrypter and ripper that capable to remove commercial Blu-ray copy protection, as well as rip Blu-ray to Android tablet compatible video formats without losing quality. Besides, this easy-to-use yet professional Blu-ray ripping program also provides customized settings for 150+ popular devices. Thanks to the built-in editor, you can trim the video length, crop the black bar, add personal watermark, adjust video effects as you like. Tip: If you are Windows user and plan to get Apple ProRes video on Windows 10, you need to free download Acrok HD Video Converter Windows version. Please select the appropriate version for you. How to rip and convert Blu-ray for Galaxy Tab S4? Place the Blu-ray disk into the Blu-ray drive on the computer and then open up the best Blu-ray to Galaxy Tab S4 Converter, the application will take a few seconds to detect and open the video source. Click the "Load Disc" button on the top left side of the interface to import the Blu-ray content. You can clikc "Add files" or "Add folder" to import Blu-ray ISO, Blu-ray folder files. After loads, the titles along with correlative details will be presented on the interface that looks like the screenshot shown below. Blu-ray movie might contain several subtitle and audio tracks in one single title, you can choose one desired track for each title in Subtitle/Audio box. Now comes to the more complicated yet critical part of the process - defining the output preferences. Hit the "Format" dropdown menu on the lower left-hand side of the interface. A pull-down panel is displayed as follows. Now you should see a host of sorted format profiles, including different kinds of pre-defined device profiles. To play Blu-ray movie on Galaxy Tab S4, you can choose to go to "Android" category and select a specific format as output format. 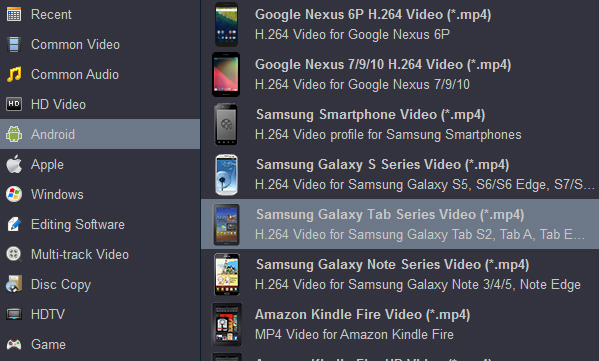 "Samsung Galaxy Tab Series Video (*.mp4)" is highly recommended. Tip: Resolution will affect the video output size pretty heavily. By default, this utility will keep 1080p natively. However, you may want to downscale to 720p, which is still HD movie but takes up quite a bit less space, then you could change into 1280*720 in the Resolution drop-down list. This step is the simplest, just click the "Convert" button, this Galaxy Tab S4 Blu-ray Ripper will automatically convert your Blu-ray into your selected format that's playable well on Galaxy Tab S4. Open the output folder to locate the new created MP4 files, then you could connect your Samsung Galaxy Tab S4 with your machine via USB cables and easily transfer resulting files to it. You now are ready for viewing movies on your Galaxy Tab S4 for more enjoyment on the go. I like Acrok software. Not only I got a video converter, but I also got a free media player.